For this Foodie Friday I am sharing something delicious! But first, a short back story…. in catered food from a delicious local sandwich shop. It was seriously the best food. Amazing bread, salad and treats. 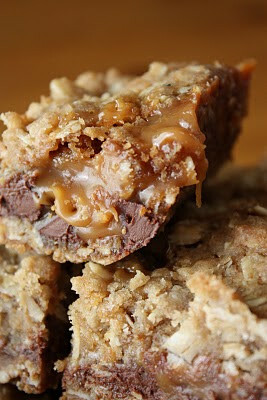 They had these caramel, oatmeal, chocolate chip bars that were simply amazing. But if you didn’t grab one right away, you didn’t get one because people would hoard them! So I have since tried to find a recipe for something similar with no luck, until recently. and I finally made these yesterday! Mix caramels and cream in a saucepan over low heat. Stir until completely smooth; set aside. Pat half of the oatmeal mixture into the bottom of an 8×8″ pan. Remove pan from oven and sprinkle chocolate chips over crust. Pour caramel mixture over chocolate chips. Crumble remaining oatmeal mixture over caramel. Put back in the oven and bake an additional 15-20 minutes, until the edges are lightly browned. Remove from oven and cool completely before cutting. Add remaining oatmeal mixture, and bake! but they should be served at room temperature. For a 9×13 pan, double the recipe. it works for what I want. What I’d do different next time? and the bottom was stuck a little. So spray the bottom of the pan! Also, next time I will use a 9×11 pan to make them a little thinner. They were just a little too thick for me. One last thing: you cook these for 15-20 minutes until the edges are lightly brown. because I kept cooking a little longer! But they will be done after the time above! Seriously, try these! They are rich, but delicious! I pinned these also. Glad to have your review of them before I made them. They look delicious. GAH!! these are NOT on my dit…good thing I’m NOT ON a diet, lol. Thanks for sharing!! Hey lady!! I just found your cute blog via the hop and added myself to your followers! Also I’d love to have you check out a fabulous OSCAR DE LA RENTA giveaway I’m having right now! !